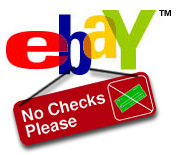 Sellers are saying eBay's ban on checks and money orders is, in effect, a move to a PayPal-only policy - at least for the many sellers who don't have their own credit card merchant account. Buyers may be unaware of the policy that goes into effect during the holiday shopping season - and it's unclear what those shoppers who can't or don't wish to use PayPal and credit cards on eBay will do in response to the policy. Seller confusion could lead to buyer confusion if they receive conflicting information from sellers about whether or not they may accept paper payments. The ban on paper payments will take effect in late October, and eBay will continue to ban competitive online payment services, except for a service called ProPay. eBay had for several years cited concerns over Google's track record of providing safe and reliable financial and/or banking related services, as well as concerns about privacy issues, as the reason for banning its Checkout payment service. But eBay added messaging to its website last week saying it would ban Google Checkout, Checkout by Amazon or Amazon Flexible Payment Services because "Google's and Amazon's products and services compete with eBay on a number of levels, so we are not going to allow them on eBay." It's not clear what effect, if any, eBay's new payment policy may have on the class-action antitrust lawsuit filed against it in 2007. In its motion to dismiss last year, eBay wrote, "Plaintiffs acknowledge, as they must, that eBay sellers are free to accept a wide variety of payment forms. They can accept Visa, MasterCard, Discover or American Express. They can accept cash, checks or money orders. They can accept online payments from at least four online payment services other than PayPal: Bidpay, Propay.com, Checkfree.com, and Hyperwallet.com." eBay banned cash payments in 2006 and further limited payment methods last year. Beginning in late October, eBay will limit acceptable payment methods to merchant credit card accounts, ProPay, and PayPal. Update 8/29/08: See new information in, eBay to Expand Allowed Payment Services in 2009.